Preparing for, and recovering from, a crash. A version of this article was originally published in the March/April 2012 issue of Inside Motorcycles magazine. While the inherent danger of throwing a leg over a bike is something we are all aware of, there generally isn't a lot of discussion of the issue unless it is vague banter about a friend of a friend or an incident read about online. Unfortunately, ignoring the subject doesn't do much in practical terms of preparing for some of the harsh realities of the physical and financial recovery after a collision. Are you prepared for a nasty end to your pleasant ride? Are your family and friends? What if you are injured? Do you have a support network to assist you on your long road to recovery? 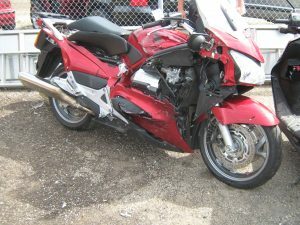 What if your bike is damaged or a write-off? Are you prepared for the financial battle you will face? The intent of this article is to ensure you are prepared should you suffer a close encounter of the unwanted kind. the day after suffering Acute Toyota Impact Syndrome in 2011. The tipover wing is meant to protect the bodywork and v-four engine but also saved my right leg from getting crushed. Note, my footpeg is missing, brake pedal is bent, and exhaust pipe is dented. Much of the preparation for a speedy recovery begins well ahead of the event. In fact, you should start preparing for the worst before you bring your bike home. I highly recommend adding some side protection like highway bars or engine guards to any bike and not just to protect the paint job and chrome. 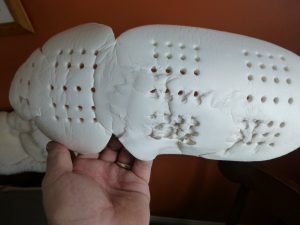 The tip-over wing on my Honda ST1300 took the brunt of the impact which meant my calf only suffered serious swelling and bruising rather than getting crushed. Red Star - point of impact. Purple Arrow - westbound car ended up facing north. Red Arrow - Northbound bike ended up in the grass. Red Ellipse - Police and Ambulance personnel told me I ended up 60-70 m down the road. Are you physically fit? If you've ever struggled with an exercise program just imagine how much harder physiotherapy will be if you have to build up the underlying out-of-shape muscles while trying to recover from injury. Put technology to use by creating ICE entries (In Case of Emergency) at the top of your cell phone contact list to allow your loved ones to be easily notified should something happen. Include the person's name and relationship (ie. a_ICE Mary spouse) to help make that dreaded phone call a little easier. If you don't have a cell phone pack an ICE list with your registration and insurance papers on the bike. A RoadID (www.roadid.com) or some form of wearable ID is another good low-tech option. Most gear manufacturers also offer Emergency Info options. If you often travel alone or ride long distances get a Satellite SPOT Tracker (www.findmespot.ca) in case the only witnesses as you slide off a corner are squirrels and owls. Even though it seems most people prefer passing by rather than stopping and getting involved do your best to get witness information. Use your cell phone camera to get photos of the scene, people, and vehicles involved. If, like me, you are laying on the road before getting strapped to a board and hauled to the hospital the best you can hope for is that the emergency personnel collect witness statements on your behalf. And do the right thing when you see a collision – stop and give assistance if you can but at the very least leave your contact info and a statement of what you saw. My injuries have healed in the nearly five years since the first collision but there is still no legal resolution [2018 update - 2007 collision was resolved after nearly 7.5 years. 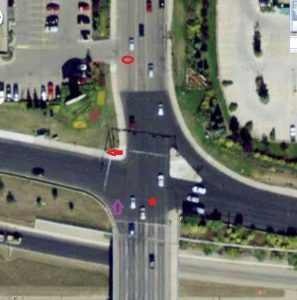 I have permanent injuries that I deal with daily from the 2011 collision which still isn't resolved even though the other driver failed to stop for a red light]. That should raise a big red flag. Don’t rely on your memory. Start a diary as soon as you are able to and record your recovery progress. Include trips taken for treatments (dates, mileage, parking cost, and any supplies you have to buy) as you need accurate documentation of the affect this event had on your life and justification for any compensation you may seek. Be specific regarding pain and any impaired functionality (did you have to hire someone to shovel your snow?) or lingering disability. Have you planned any vacations or trips? What reservations have you made and what deposits have been paid? Are the plans well-documented and readily available? If you are incapacitated your family or friends may be able to cancel your plans and save you the further pain of paying for a trip you can't take. While the exterior of my Kevlar riding jacket had some minor damage the shoulder armour inside was destroyed. But, this prevented a shattered collarbone. What insurance coverage do you have and how healthy is your bank account? Do you have short-term and/or long-term disability coverage through your employer? If you are unable to work this coverage could keep you from losing your home. Health care providers in Alberta can directly bill your Auto Insurance Company for a maximum of 21 treatments in the first 90 days. After reaching those limits you have to pay for treatment yourself then submit the receipt to your private health plan for reimbursement [2018 update - many practitioners can now direct-bill your private health plan]. Once you use up any private benefits your auto insurance will reimburse you but only if more paperwork has been filed justifying continued treatments. Unless you want to be making photocopies every day to mail forms and receipts you will find that carrying an out-of-pocket balance of $1000 or more is not unrealistic. 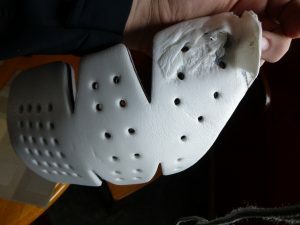 The exterior on the shin of my Kevlar riding pants was unblemished but the interior armour padding was melted and deformed. Your recovery also depends on where you live as legislation varies between Provinces. Rehabilitation benefits, for example, can be paid for up to 10 years in some provinces and only 2 years in others after which you are one your own again and left to hope you can recoup your expenses through a lawsuit. While you are trying to recover from your injuries there's a claims adjuster somewhere who just wants to get your vehicle file off their desk. This can cause some of the greatest pain of the entire proceedings. We love our machines and know the time, effort, and money we have invested getting them just right. 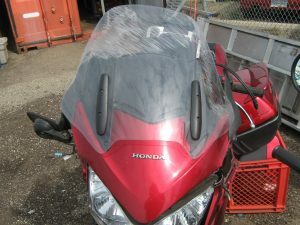 Can you be certain you will get a fair amount if your bike is deemed a write-off? Can you prove to the insurance company the value of your add-ons? Do you know where your receipts are? Start a file folder and keep all of your receipts including the smallest purchase and all maintenance records. My bike was serviced 10 days before it got destroyed and I used the report to prove it was still in excellent mechanical condition thereby worthy of a higher valuation than was originally assessed. Scan all the receipts into electronic format (jpg or pdf) and store them in a safe location on a DVD (use a DVD–RW so you can add to it) or USB stick. if you've never seen a motorcycle crash (watch some racing) they do crazy things. At some point in the 17 meters that the bike traveled it was nose-down sliding on the windshield! And after all of the preceding joy we get to the truly morbid preparation. Ensure you have a Will that is up-to-date. You don't have to go to a lawyer to create a Will. A hand-written note, as long as it is signed and dated, is perfectly legal and ensures your estate is handled in the manner you wish. In keeping with meeting your intentions, what are your wishes as far as quality of life is concerned? Do you want to be kept alive by machines if you are in a vegetative state? If you’ve signed a Donor Card make sure your loved ones know about your intended generosity. If you haven’t already prepared for the worst I suggest you take some time this off-season to locate and organize your receipts, prepare your technology, inform your family and friends of any plans you are making, exercise a bit and then attend a bike show or visit your favourite dealer and get yourself some quality protective gear. Finally, spend some time looking forward to the excitement another riding season brings and plan to get out and enjoy it as often as you can. You never know if the ride you are taking might be your last, or exactly how it will end, but being properly prepared for literally hitting the road can provide some peace of mind the next time you, figuratively, hit the road. Unlike tips on storing your bike for winter, I sincerely hope you never need to deal with the aftermath alluded to in this article. Ideally, you can put this away after reading and never refer to it again. Please consider some of the preceding points (such as ATGATT*) as just another form of insurance. It’s closing in on 40 years since I first rode a motorcycle, and wearing my insurance has never dampened my riding pleasure. 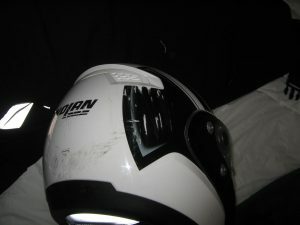 I benefitted from the protection when I needed it, and now relish the thought of riding again soon. And savoring every ride is something we should all aim for. 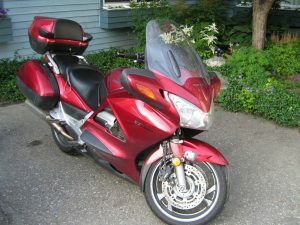 Bruce Thomas is a motorcycle enthusiast and freelance travel writer. When he isn't riding his motorcycle near and far he calls Edmonton, AB home. AMSS launched Medical Data Carrier in January 2019, made available to all Alberta riders that affixes to your helmet. 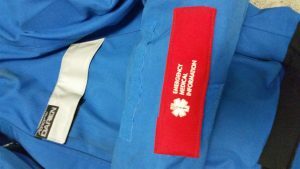 This can be done in place of the Emergency Medical Information Pocket described above.